Today is a better day for dreaming than gardening. Dire weather forecasts for this weekend called for snow, slush, rain, ice and wind, and some weatherman even said the "B" word... blizzard. The reality was we got some snow yesterday, but temperatures were warm enough that roads were slushy not icy. Then later around 11:00 PM, it started to rain. But the weathermen insisted we would also get some snow on top of the ice. And they were right, but I don't think we got as much accumulation as they predicted. 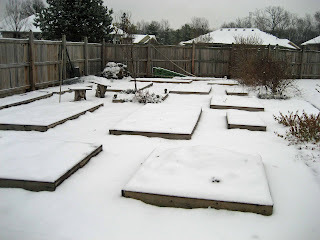 I must confess that I took my outdoor pictures for Garden Bloggers Bloom Day on the 14th, when the raised bed vegetable garden looked like this. I wanted to get my post up so people could leave their comments about their own bloom day posts. Plus, like everyone else, weekends right now are busy so it made sense to fudge it a bit and post blooms from the 14th. Then on the 15th, we got some snow. I doubt I would have found the little vinca flower in all this, if I had waited until the 15th to take my pictures. 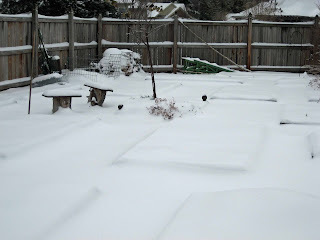 Now this morning the garden looks like this. It is not nearly as much snow as predicted, but it's enough that I got out my new snowblower. Clearing snow off the driveway is sort of like mowing the grass. - You can see where you've been, just like mowing. That's important because if you can't see where you've been, it means that the wind is probably blowing the snow right back. - You can work up a good sweat, just like mowing. The difference is you don't really get hot, like you would in the summer, so you don't realize how hard you've been working. That's how some people over exert themselves and ending up in the hospital or worse. If you aren't in good enough shape to mow your own lawn, don't try to shovel or clear the snow off your driveway. - You get some satisfaction of a job well done when you see the driveway all cleared off, but you know you are likely to have to do it again, just like with mowing. There is one key difference between mowing the lawn and clearing snow off a driveway. Do you know what it is? If you don't mow the lawn, the grass just gets taller and taller and when you eventually do it, it is a lot of work. If you don't clear the snow off your driveway, eventually it gets warmer, the snow melts and you don't have to do it at all! High of 42 by Tuesday, so this snow will turn to sloppy wet in no time at all! My DB is of the thought that you leave the snow because it will melt away. He only shovels off a portion of the patio so the birds can get their seeds easily. We so rarely get so much snow that we can't get in and out of our driveway. So this thinking works for most snows. This snow is one of those snows that we will let melt away. Keep toasty while dreamin' of May. I'm incapable of leaving snow on the driveway. 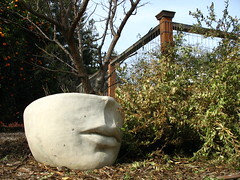 I have to see concrete or it'll eat at me all day. I'm sure there's medication for this, but think of all the exercise I get. We got about 8-10 inches, though it's hard to measure because the wind is blowing so much. But, hopefully by the middle of the week, it will be melting off. I'm so glad we didn't get as much as some were saying. 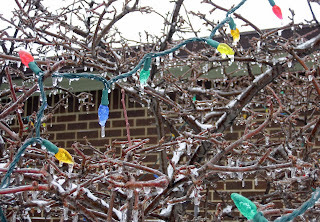 We got about 6-7 inches of snow and the plants are covered with ice. Our driveway has an incline, so we have to shovel lest we pack the snow and slide to the bottom. It is also difficult to get up into the garage one the snow gets packed down. One nice benefit of having a strapping 15 yo son! "Blizzard"? Oh! Blizzards! You're getting blizzards! I love blizzards. Indiana is awesome! I'm 1 of those people who has to remove every bit of snow from the driveway & walk. DH thinks it's OK as long as you can get in & out of the driveway without getting stuck. It's 1 of the few things we hold opposing world views about. Those who have never lived in a snowy climate just can't understand how passionate the driveway clearing debate can get. The temperatures have fallen to freezing point so there is a slight schance of a white Christmas this year. Thank you for thinking of us in posting early. And you were rewarded for your thoughtfulness with the little vinca shot. I love your raised beds. 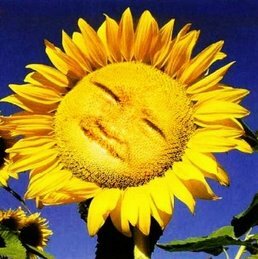 Do you plant mostly vegetables, or a mix with flowering plants. How many do you have, what is the size and spacing with the paths. It all looks so neat and organized. I don't have any snow to write about but it is cold and windy here in Tennessee. Lisa at Greenbow... Hmmm, sounds like an excuse to me! Steven... Yes, I have a neighbor like that, but he doesn't seem inclined to do my driveway, too. Though he has in the past cleaned off the sidewalk in front of my house. Vonlafin... Lafayette always gets more snow than Indy! Robin's Nesting Place... My driveway is the same way... if I don't clear off the snow, I can't get the car up the drive into the garage. Chuck B.... I agree, Indiana is awesome, though we did not end up having a blizzard here. But we can always go get one at the DQ! Mr. McGregor's Daughter... I agree, couple's need to agree on how to handle the snow. Corinna... Now that's a good kind of fight, if the driveway got cleaned off in the process. Nickie... Ah, the frozen northern part of Indiana. Frances... Thank you for the nice comment on my raised bed garden. 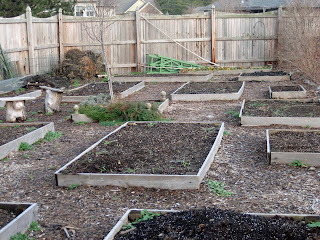 Do a search on my blog for 'raised bed' and you should find several posts with details about it. Or, wait until January, and just for you, I'll post more about it. That reminds me of an old joke from a TV news anchorman here. Do you know what they call snow removal in Virginia?